Our cats are spoiled, spoiled, spoiled. They meow "jump" and we say "how high?" Thursday night, kitty number two was here in the computer room with mom and me. We were both sitting on the couch and the cat was on the area rug on the floor in front of us. Along the back of the couch are three stuffed teddy bears...a standard brown type, a panda, and a polar bear I made for mother dear years ago as a Christmas present. She collects them so I went to a Build-A-Bear store in a mall when I lived in California and shipped it back for her gift. Well, I take the polar bear down and hold him so he is standing on the floor facing the cat. The kitty's eyes start to get big and black. I start moving the bear back and forth like it is walking towards the cat. With no warning, she jumps about a foot in the air, runs through the house, and then upstairs to hide. I had no idea it would scare her so, but I tell you, mom and I laughed the hardest we have in a long time. This picture is pretty close to how the cat looks. 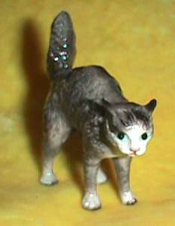 White face and paws, gray coat, and relatively short tail. Poor thing. It took her a day to get up the courage to come back into the computer room! My Mum has a cat too, and she seems able to communicate with it very well. Honestly, I can't communicate with cats, and I find them cold. Perhaps, that explains why I have a dog myself.